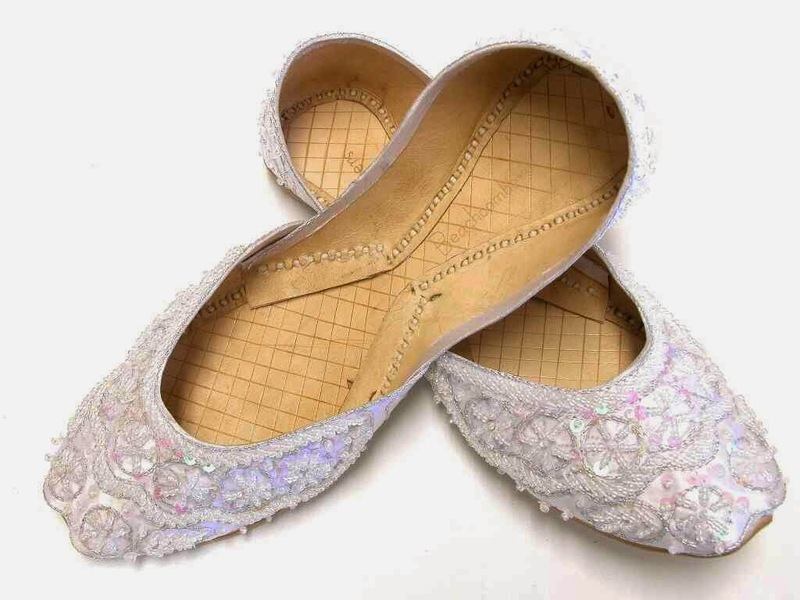 Beachcombers Bazaar Henna Studio and Supply: Beautiful Bridal Flats: Wedding Shoes with Style! Have you ever tried to find cute white flats? Tough, isn't it? White flats tend to be boring and make your feet look big. That's okay, I'm looking out for you! Indian shoes work perfectly for flat white wedding shoes! These beautiful Indian shoes are called khussa, pronounced kus-sa (kus rhymes with puss as in Puss-and-Boots) NOT koos-sa (rhymes with moose). They are wrapped in silk and covered in beautiful patterns of beads and sequins. 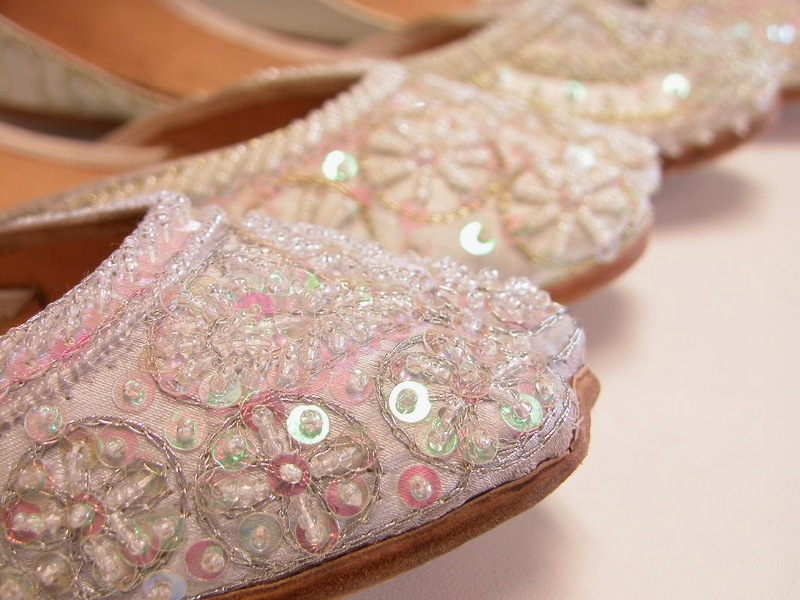 Each beaded flat is handmade by master stitchers in Pakistan and India. In addition to being beautiful, these shoes become incredibly comfortable. They seem tight and uncomfortable when new, but break in to be a dream! There is no left and right when they are new, as they custom form to the shape of your foot (creating a custom left and right) as they break-in. Perfect shoes for dancing the night away at a wedding reception! Warm white bridal shoes work with ivory wedding dresses. There are two basic white colors in these wedding flats, a cool silvery white and a warm ivory white. They will not be an exact match to a wedding dress, but they should work within the tonal range of most wedding dresses. If the dress is cool, meaning it has a blue or silver undertone the cool white Indian shoes work. If the dress is warm white, ivory, or cream the warm white beaded flats will work well. All shoes that are covered in silk can be tinted to any color you like at your local shoe repair shop or bridal shoe store. 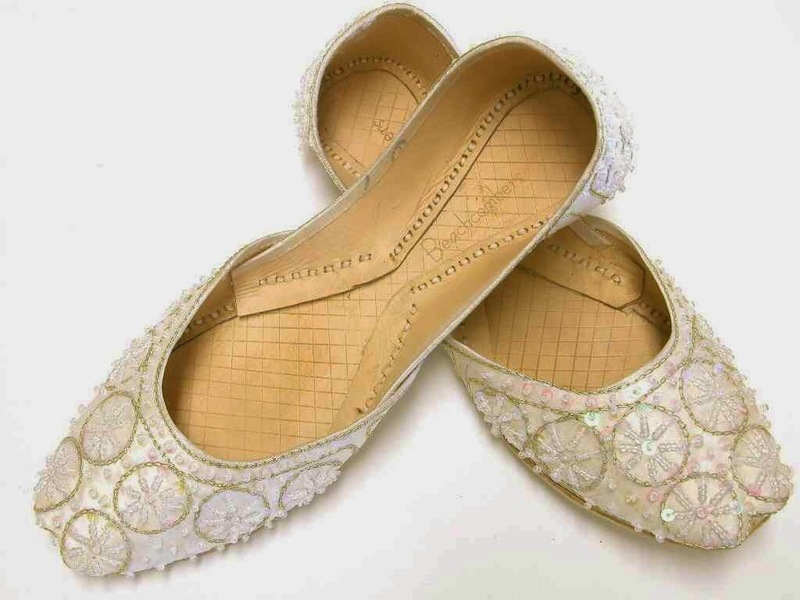 Multiple styles and sizes of white flat bridal shoes to buy online. Though khussa Indian shoes can be worn every day, they have exposed stitching so they should be worn with care. Never wear them in wet conditions and be aware of scuffing the leather soles so far that the stitches pop. One more reason to love Beachcombers khussa Indian shoes? Only 24 or each pair are made then the style is retired. This makes your handmade wedding shoes even more exclusive and special!